Shortly after ten this morning we heard a terrible racket coming from the garden. Sunburst ran outside to investigate. She darted back in to grab the camera and zoomed back outside before I knew what was happening. She had found a tawny owl perched in the evergreen. So much for being nocturnal. She watched it stretch its wings and turn to look at her with wide eyes before taking flight. Her guess is that it was having a little nap and the awful sound (wood pigeons fighting with the squirrels) woke it up. Who knows for sure, but wow! 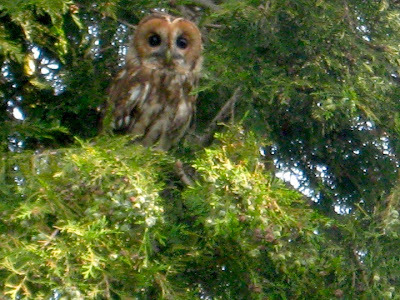 A tawny owl in the garden? Really?! The owl looks almost like a stuffed animal! Great photograph and amazing glimpse of nature. It really does! I was so surprised that she saw this... and in our garden, of all places. An amazingly great photo of the owl. Quick thinking on Sunburst's part.